NOAA study: Asking what caused California's drought misses the point. 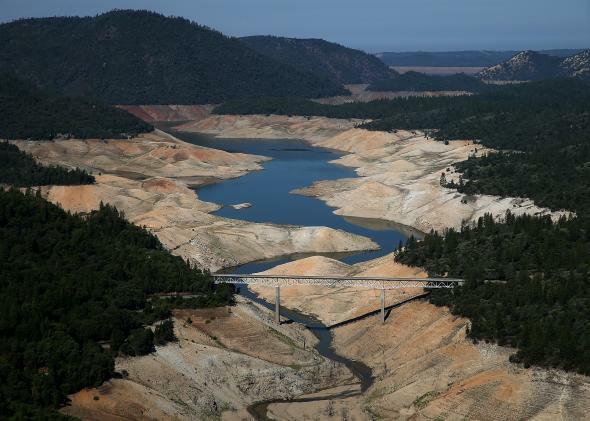 A section of Lake Oroville is seen nearly dry on Aug. 19, 2014, in Oroville, California. On Monday, the NOAA released a new report examining the origins of the weird weather that’s led to California’s drought—which, by one estimate, is the region’s worst in at least 1,200 years. The NOAA study attempted to attribute a root cause to the lack of rainfall. Was it natural? Was it global warming? The results found that the main drivers were a mix of persistent Pacific Ocean temperature patterns and the randomness of the atmosphere, or “internal variability.” Some are taking this to mean that climate change didn’t significantly impact the drought. But that interpretation is misleading. I hope that in all my writing on this topic, I’ve never said or implied that any specific weather or climate event was definitively caused by climate change. That fact is almost impossible to know—even more, it’s probably dangerous to even ask it. The atmosphere just doesn’t work in cause and effect. It’s a huge, dynamic system, and everything affects everything else. The research has convinced me that the drought probably had an origin in natural variability of the climate system. But I also still believe—and don’t think that these are mutually exclusive—that global warming nevertheless contributed, perhaps substantially, to California’s current drought. Saying the CA drought is "natural" is like saying a smoker died of lung cancer, not cigarettes. It is misleading. But in an email conversation with Slate, Richard Seager, the lead author of the NOAA report, argued that the impact of rising temperatures on California’s drought was minimal. Again, even if the exceptional dryness over the last three years was proximately due to random atmospheric fluctuations, that doesn’t address the long-term issue that California has with its increasing reliance on dwindling snowpack and the overdrawn Colorado River. No reasonable person could say with a straight face that California’s drought impacts aren’t worse because of human-caused climate change. And, of course, it’s the impacts that affect people’s lives, not which high-pressure system was shifted in what direction for how many months. I spoke by phone with Peter Gleick, a hydroclimatologist and president of the Pacific Institute in Oakland, California​, who coincidentally wrote a useful blog post review about how climate change is impacting California’s drought just a few hours before Monday’s NOAA report was released. So before you go out and buy an SUV this afternoon in Rancho Cucamonga in celebration of California’s liberation from the clutches of climate change, remember that Monday’s NOAA report was only one study, and at odds with others published earlier this year by the same authors.